Players must read and react to different situations. 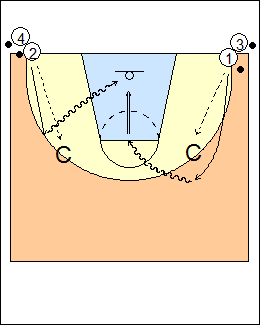 Two players dribble out from the baseline, the first one to reach the cone on his side decides whether to crossover and drive baseline for a power layup, or curl over the cone for a pull-up jump shot. The second player has to make a read and do the opposite. Switch sides, 3 and 4 go next. Use outside-inside footwork for a power layup (also for a jump hook), counters are a) forward pivot (spin) away for a shot, then b) step-through for a layup (another forward pivot). On the perimeter and in the post, your pivot foot should be away from your defender. Chris Oliver - a front pivot on the back foot is used to space away from the defender, the counter is to hook back with a reverse pivot (there is no space for an up and under when the defender jams into the attacker), the second counter is front pivot back to the middle. 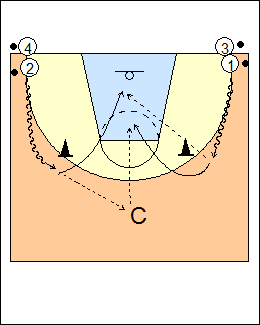 b) two lines of players start at the top outside the 3-point line, one side are the leaders, the first two players hit their balls together, lateral dribble to the cone on their side, the leader will go outside the cone and attack the rim for a power lay-up or go inside the cone to a jumper (crossover dribble), partner does the opposite. See Layups - Turn the corner. 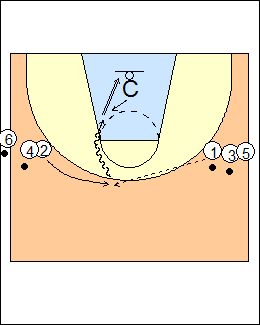 Both players dribble out, coach shows his hands to one player (here 2), who passes to coach, cuts for a pass from the other player, the second player cuts for a pass from coach, both players finish with a power layup. 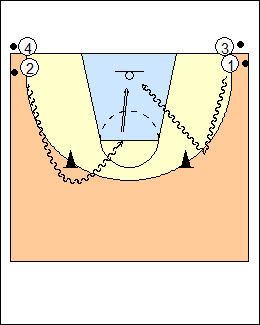 Two coaches are back-to-back at the foul line, both players spin a pass out from the baseline, follow and use a crossover step to start their dribble (crossover start), if the coach on their side shows his hands, pass for a give and go, otherwise drive for a power layup. - players dribble to or around cones from the corners. Allison McNeill - starting from each sideline at halfcourt, players speed dribble and read coach on their side. Jaime McLean - no coaches, players spin passes from the corners, crossover step, drive and finish with a stretch (reach-out) layup, power layup (progression - spin away, spin away and step through), reverse layup (alternate sides). See Post play - Pasquali power layups. Coach is at the basket, 2 cuts and gets a pass from 1, drives left (crossover step), stops with outside-inside footwork, finishes with a power layup if coach does not put up his hands, or spins away for a shot if coach puts his hands up. 1 will go next, and drive right. 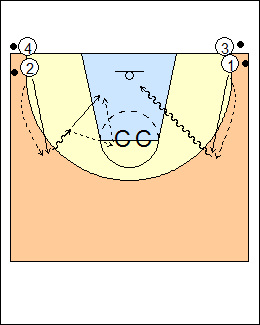 See Layups - Kiwi cutting, Shooting - Jumper 5, Continuous. Progression - pull up for a jump shot if coach steps into the line of the drive (shown), otherwise keep going to finish with a power layup. See Dribbling - Chair drill, 5star triple b. 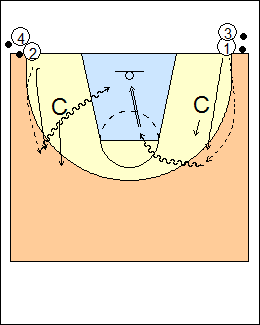 Coaches are on the three-point line, facing the basket, players pass to the coach on their side, if coach holds the ball out with his outside hand, use a crossover step and drive for a power layup (shown for 2, the inside foot is the pivot foot), if coach holds the ball out with his inside hand, curl over and drive middle for a pull-up jump shot (shown for 1, the outside foot is the pivot foot). See Footwork - Pasquali pivoting. - reverse pivot on the outside foot, crossover middle. 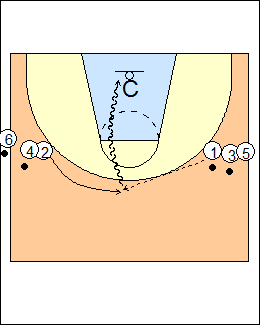 See Shooting - Chair drills, Footwork - Jay Wright jab-swing series. 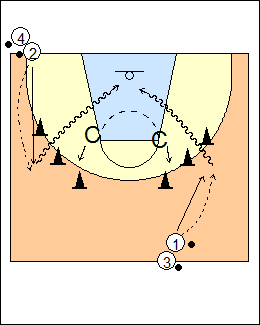 Read the open door - three cones on each side form two gates, players spin a pass to the wing from the baseline on one side, and from out top on the other side, before catching read where coach is standing, use a curl or crossover dribble, finish with a power layup or pull-up shot going baseline, pull up for a shot going to the middle. Coaches are defenders, players spin a pass from the baseline and follow, if coach trails, use a curl dribble to the middle for a pull-up shot at the elbow (shown for 1), if coach extends to take away middle, use a crossover dribble to attack baseline (shown for 2). See 1 on 1 - Dave Malowski.